Electric scooters are a lot of fun. They are small, easy to ride, and fast. With their motors and batteries, there is very little effort needed to drive an electric scooter. 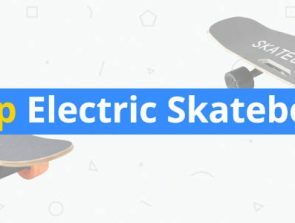 While the higher-end and fastest electric scooters are mostly recommended for use by adults, there is no reason that kids have to miss out on the fun. In this article, we list the best electric scooters that we recommend for kids. These scooters are a little slower and easier to learn than adult scooters, but we can attest to their overall quality and excellent workmanship. The Razor brand has been well-known in the industry of portable scooters for more than a decade, and we are glad that they have kept up with the times and release their own line of electric scooters. The E300 is the largest scooter in their lineup and is probably one of their best. With a maximum speed of 15 mph, this scooter is probably pushing the limits of what can be considered as a safe speed for kids. The E300 is capable of a carrying a maximum capacity of 220 pounds, more than enough for kids and probably most fully-grown adults. To help keeps safely mounted, the deck of the scooter is wider than most scooters and has a non-skid surface. The motors of the E300 exhibit very good power and torque, and accelerating is a smooth and responsive process. Even at high speeds, stability is aided by the scooter’s wide and plump tires. The wheels of the E300 do not have a spring suspension system, but the tires are thick enough to absorb the usual vibration from bumpy roads. The batteries of the electric scooter allow up to 40 minutes of continuous use. Although this should be more than long enough for a scooter made for leisure, the bad news is that the E300 still uses a pair of lead acid batteries to provide this power. Not only are lead acid batteries heavier, which contribute to the 46 lb weight of the E300, but they are also more sensitive and less longer-lasting than Li-ion counterparts. Despite its shortcomings, the Razor E300 is an old and reliable that has enjoyed sustained popularity over the years. It’s no longer a top-of-the-line model, but put in the context of its low price, it’s no wonder why it’s still one of the best-selling electric scooters today. At first glance, the Glion Dolly looks a little more rugged and solidly built than your usual drone at this price range. Beneath its streamlined design is an exceptionally portable electric scooter that can travel at a maximum speed of 15 mph. It’s not much faster than most other electric scooters, but this may be a good thing if it’s meant to be used by kids. What makes the Glion Dolly stand out is the ease with which it can be folded down: it takes barely 3 seconds to fold and unfold this scooter. It even comes with a pull-out trolley handle for when you need to bring it on a train or bus. In its folded form, the Glion Dolly can stand up on its own, which is perfect for storage or while waiting for the train. The Glion Dolly has excellent safety features, such as an ultra-bright headlight and a built-in tail reflector to keep it visible even at night. The rear wheel of the Glion Dolly has an electric braking system that slows the scooter down gradually in case of emergency braking to avoid skidding in slippery roads. The Glion Dolly weighs 28 pounds. This weight is not so bad considering that you can pull it around like a trolley. Being a light scooter contributes to the Glion Dolly being able to travel around 15 miles per battery cycle. With brushless, gearless, and chainless motors, the Glion Dolly is whisper quiet when running. Fewer moving parts also means less chances of anything breaking. This scooter may be a little more expensive compared to other electric scooters for kids, but it is also a lot lighter and more long-lasting. You can consider the added cost an investment made towards less headaches in the future over repairs or replacement of parts. From the well-known Razor brand of electric scooters comes the E125: a very affordable model that has just enough features for kids. The motor of the E125 allows to reach speeds of up to 10 mph – not impressively fast but can be considered a safe and fun setting. The motor of the E125 is not self-starting but instead requires a manual kickoff to 3 mph before it starts. The electric scooter can run up to 40 minutes on a single battery cycle. Charging the battery to full capacity takes around 12 hours. With a weight capacity limit of 120 lbs, the E125 is literally designed for children. It features intuitive hand controls and a twist-grip mechanism for controlling the throttle. The brake can also be engaged with hand controls. The handlebar of the E125 is fully adjustable, so you need not worry about your kid being too big or too small for this scooter. 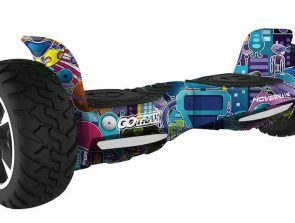 The 8-inch pneumatic front tire and 4.9-inch polyurethane rear wheel should prove stable enough for most types of terrain, but they may be too small to negotiate excessively bumpy and uneven surfaces. With its foldable design and a frame that weighs only 29 lbs, the E125 is a highly portable machine that you can just pick up and hand carry if needed. It’s a perfect little toy scooter that you can slip right into the trunk of your car on road trips. It’s also small and light enough to bring into a bus or train. 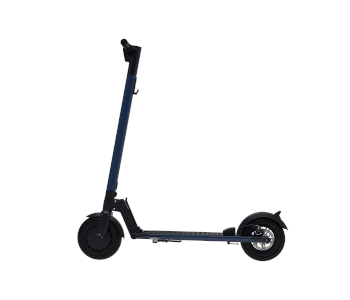 The E125 may not be perfect, but it is an excellent choice for an electric scooter in its price range. The Pocket Euro electric scooter is a completely different offering from Euro that mimics the look of retro scooters like the Vespa or Lambretta. In exchange for portability and a lightweight build, this model includes a thick padded foam seat for maximum comfort, which also doubles as a storage compartment for small items. This sit-down electric scooter can travel for up to 10 miles on a single battery cycle. It is powered by a 12V sealed lead acid battery, which can be charged to full capacity in around 12 hours. The scooter can reach a maximum speed of 15 mph via its chain-driven motor. Acceleration and speed control are adjusted via an intuitive hand grip throttle. The rear wheel brake can also be engaged via hand controls, although it is not nearly responsive enough for emergency braking. The Pocket Euro is equipped with 12-inch pneumatic tires that allow it to negotiate difficult terrain such as gravel or dirt. A shock absorption system at the rear wheel allows for a smooth ride even on uneven terrain. 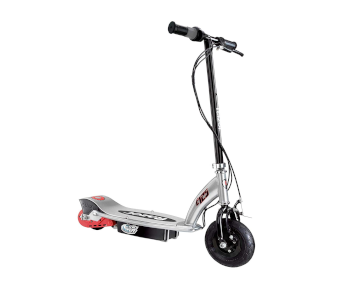 All in all, the Pocket Euro is a road-worthy electronic scooter that is easy to use and comfortable. With just a 10-mile driving distance in one battery charge, you won’t be able to travel for very long, but this is an excellent electric scooter for leisurely rides around the neighborhood. The Reverb Electric Scooter from Pulse Performance is a no-frills model that is very affordable and easy to learn for kids. 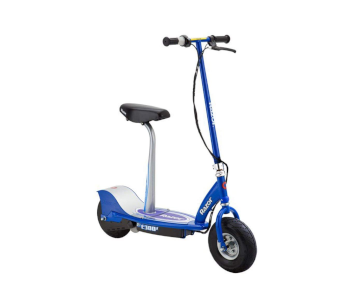 Its 100W motor is started by manual kick-off and can reach speeds of up to 10 mph. A chain-drive system transmits power from the motor to the front wheel. With a weight capacity of 120 lbs, the Reverb Electric Scooter is clearly designed for kids. A 24V rechargeable battery provides up to 40 minutes of power for continuous riding. 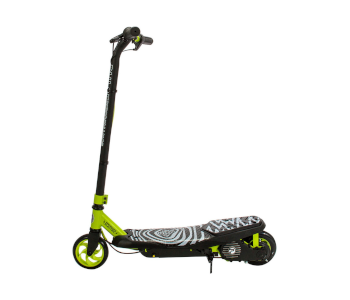 The contoured stem and handle bars with a twist-grip throttle, as well as the two-piece composite deck traction surface of the deck help keep young riders hold on to the electric scooter. The hand brake is also incorporated into the handlebars for easy access and controlled braking. Zero-maintenance polyurethane wheels means that you never need to worry about having to inflate tires again. All in all, the robust and simple design of the Reverb Electric Scooter requires very little maintenance. It is a compact and lightweight electric scooter that is easy to bring along for an afternoon in the park or long road trips. 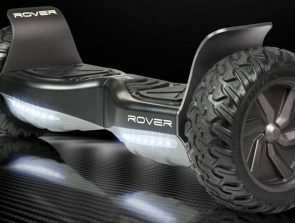 With such an affordable price tag, you are very unlikely to be disappointed with the Reverb Electronic Scooter. The Razor E300S is a fun scooter that fits both kids and young adults alike with 220-lb weight capacity. At a 15mph maximum speed, it is the fastest electric scooter to come out of the Razor brand to date. With a detachable seat, you have the option of using the E300S as either a sit-down or stand-up electric scooter. The two 12V sealed lead acid batteries can provide the E300S with enough power for about 40 minutes of continuous use. A larger than usual deck and soft rubber grips on the handlebars ensures that even young kids will not have a hard time holding on to the E300S. Extra wide 10-inch pneumatic tires keep a firm grip with the ground, so the E300S should perform well even in wet surfaces. A twist-grip mechanism on the handlebars provides speed control, while a hand brake engages the braking system in the rear wheel. The E300S is a very easy scooter to master, even young kids should not have a problem with it. Although having a cushioned seat is nice, the additional weight of the seat post and padded seat brings the total weight of the E300S to 52 lbs. This is a little to heavy to consider the E300S portable, but you can choose to leave behind the seat assembly to pare down the E300S to a more manageable weight. 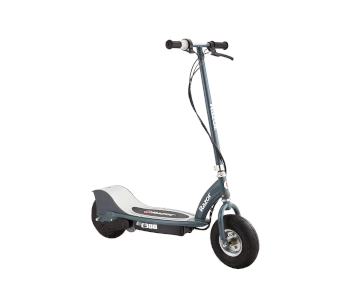 The GOTRAX GXL is a very popular all-around electric scooter that will satisfy both kids and adults. Touted as a commuting scooter, the GXL comes equipped with 8.5-inch pneumatic tires that give a safe and smooth ride over gravel or asphalt roads. The 250W motor of the GXL is the most powerful yet from GOTRAX’s lineup of electric scooters. With premium motor specs, the GXL can reach speeds of up to 15.5 mph and carry a capacity of 220 lbs max. Big kids and average-sized adults should not have a problem riding the GOTRAX GXL. 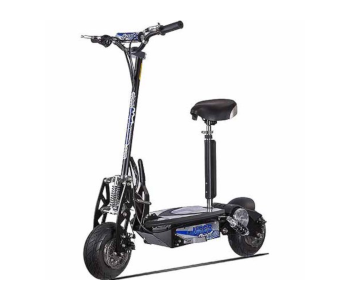 The 36V batteries allow the GXL to travel as far as 12.5 miles on a single battery cycle. The batteries of the GXL can be charged to full capacity in a relatively quick 4 hours. With its foldable design and weight of less than 30 lbs, putting away the GXL at the end of the day is easy and does not take up much space at all. GOTRAX goes beyond the usual designs of braking systems and designed the GXL with a dual front and back braking system. With both a disk braking system and a regenerative anti-lock brake system, the GXL is a much safer ride with more responsive and efficient brakes. The handlebars of the GXL come with a few nice features. An LED display show a speedometer reading, while 4 light indicators show the rider just how much battery life is left. This is a very thoughtful addition which can help a lot in battery management. The rider of this electric scooter no longer needs to play the guessing game on whether to speed up or slow down to conserve battery power. With a reliable build and well-thought features, the GOTRAX GXL has become one of the best-selling electric scooters today. 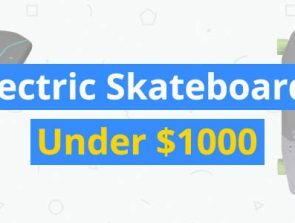 It is not exclusive an electric scooter for kids, so it’s a little on the expensive side. 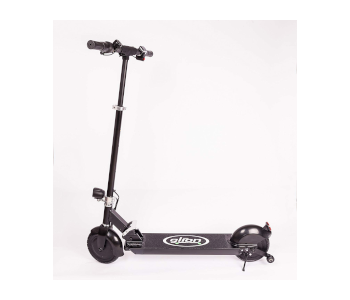 However, if you’re looking for an electric scooter that will satisfy both adults and kids alike, then you will not be disappointed with the GOTRAX GXL. The Ubers Scoot by EVO Powerboards is an extremely powerful electric scooter that boasts of an impressive top speed and battery capacity. The three SLA gel 12V batteries combine to allow the Uber Scoot to travel up to 10 miles on a single battery charge. This range can be increased to around 24 miles if you choose to upgrade the batteries to lithium-ion, also with a total 36V. The Uber Scoot comes with the option of removing and installing a cushioned seat in case you want to be comfortable riding this scooter for a few hours. Comfort is further enhanced by 10-inch pneumatic street tires and a dedicated suspension system, assuring that the Uber Scoot rides smooth even in bumpy terrain. With higher than usual numbers in weight capacity, speed, and battery time, the Uber Scoot seems like a top contender for the title of best electric scooter for kids. However, it might be a little too expensive for something that parents may consider as toys for their kids. It might also be a little too powerful for small kids, perhaps to the point of posing a danger to them. Kick scooters, fun as they may be, are so yesterday. With electric scooters, kids can have a great time riding around on motorized wheels that can travel much faster and require much less effort to operate than kick scooters. 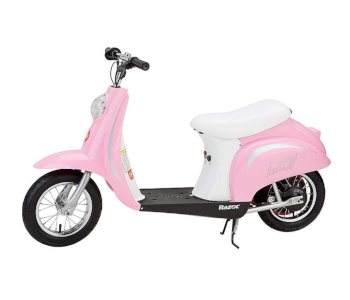 Depending on your budget and the specs that you are looking for, there is probably an electric scooter that is perfect for your kid. Electric scooters are always a hit as holiday gifts, so you better decide early!